The University of Rio Grande and Rio Grande Community College awarded Carolyn Berry as the campus police department’s, honorary, officer of the year. 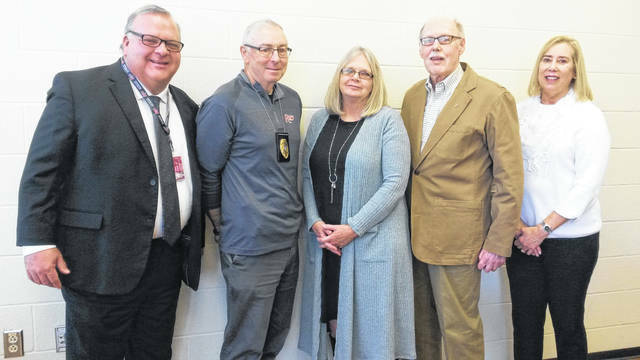 Pictured (left to right) are Chief Financial Officer Tim Pruett, Campus Police Chief Scott Borden, Officer of the Year Carolyn Berry, Board of Trustees member Larry Rees and Laura Rees. RIO GRANDE — The University of Rio Grande and Rio Grande Community College Campus Police recently presented retired Campus Police Records Clerk Carolyn Berry with the Larry and Laura Rees Certificate of Excellence Award as the department’s third, and honorary, Officer of the Year. Berry retired from Rio in August after a total of 14 years, with her most recent being nine consecutive years. University of Rio Grande Board of Trustee Larry Rees said he and his wife, Laura, appreciate the department’s dedication to serving the community and wanted to honor their excellence with this award. The Campus Police Department makes many behind the scenes contributions to protect and serve Rio that students, employees and guests do not get the opportunity to see. Interim President Dr. Catherine Clark said she believes this award is an excellent way to honor their service to Rio and make sure those contributions are recognized. Each year, the campus police department officers vote for the colleague they felt was deserving of the award by demonstrating leadership, courtesy and human compassion both in a uniform and out in the community. Campus Police Chief Scott Borden said the department unanimously voted for Berry for her dedication to the department and to the students. Berry said she is grateful to receive this award because it encourages officers to continue striving to serve and protect their Rio community. The university presented Berry with a gift of an honorary uniform ribbon plaque. As an additional gift, Mr. and Mrs. Rees also commissioned a painting for Berry.